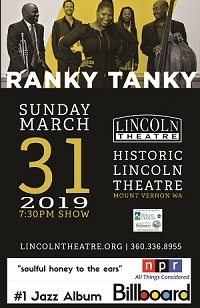 Ranky Tanky released their eponymous debut on Oct. 20th, 2017. By December of that year, the group had been been profiled on NPR’s Fresh Air with Terry Gross and their album soared to the #1 position on the Billboard, i-Tunes, and Amazon Jazz Charts. Advance Reserved Seating Tickets: $42 1st section; $37 2nd section; $32 3rd section; $27 4th section + applicable fees. Lincoln Theatre Members received $2 off.